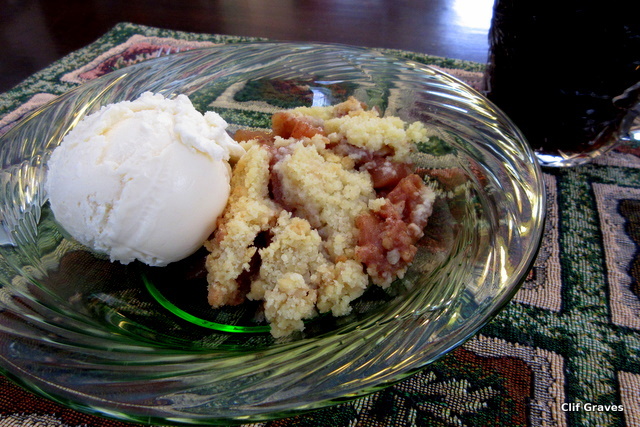 On Sunday, our friends Cheryl and Denny and Judy and Paul came over for homemade apple crisp and talk. As I’ve noted in a previous post, I really love hosting afternoon get-togethers with friends. We have a good-size dining room with an old Victorian table—the original chairs, long gone, were filled with straw—that can easily be expanded to accommodate eight to ten people. However, for me, six is the perfect number for good conversation. Apple crisp must surely be one of the best desserts to serve at a gathering. It can be made ahead of time, tucked in the refrigerator, and baked forty-five minutes or so before guests arrive. Old apples, a little wrinkled, taste perfectly good, and my blast-furnace oven does a fine bubbling job of baking the crisp. The recipe I use comes from a Craig Claiborne New York Times Cookbook, and I just follow his instructions. If I had made enough modifications to call the recipe mine, then I would happily share it. But I haven’t. Then there is the smell of apples, cinnamon, and cloves as they blend and bake. It wafts from the kitchen and drifts to the dining room, and I expect this smell stimulates the appetite. (Let’s just say that it’s a good thing I made plenty for seconds.) So you have warm spiced apples and a crunchy, buttery topping. Perfect, right? Almost. It needs a scoop of vanilla ice cream to slowly melt into the warm mixture. Whipped cream is all right, but to my way of thinking, ice cream is the jewel in the crown, so to speak. As we sat around the dining room table, we talked about many things, but one topic in particular stuck with me because I’ve been thinking about it lately—the importance of stories and how we all have them. Judy told of how one day, when her mother was young—this would have been in the 1930s—she came home to find her mother (Judy’s grandmother) sobbing as she did the ironing. “What’s wrong, what’s wrong?” Judy’s mother asked. As Judy’s grandmother ironed, she listened to the radio, to an afternoon soap opera, and something sad had happened to one of the characters. Hence the tears. Everyone nodded, and Cheryl recounted how one Christmas her book group listened to a recording of A Child’s Christmas in Wales read by the great man himself, Dylan Thomas. All the lights were turned off except for the ones on the Christmas tree, and by the sparkling lights they listened to this fine writer read his own words. “It was,” Cheryl said, smiling as she remembered. Warm apple crisp, friends around the table, shared stories. Another finest kind of way to spend a winter’s afternoon.